Going to the gym isn’t all about bulking up or slimming down, it can also be a place to meet new people, relax or have fun. Here’s our list of 10 things you can do at the gym, other than pump iron. If you prefer to savour the day and take things at a slower pace, grabbing a coffee before or after your gym session can be just the ticket. All Nuffield Health gyms have coffee facilities and many have cafés where you can catch up with friends or grab a nutritionally-balanced bite to eat after your exercise class. Life can be stressful and working out can leave you with aches and pains. So why not treat yourself to a massage in one of the Beauty Suites? Nuffield Health gyms offer a range of soothing and sports massages to leave you feeling healthier in body in mind. Alternatively, you can let the healing powers of steam do their job as you lie in the sauna and drift off to another world. Saunas are also known for their health benefits: as your core body temperature begins to rise the blood vessels will dilate, causing increased blood flow around the body. Swimming is a fantastic exercise for people of all ages and in all moods. It can help to take your mind off a stressful day, and provide a great total body workout, but one in five adults can't swim. Most Nuffield Health gyms have pools and many offer swimming lessons for both children and adults so you can take advantage of swimming's many and varied benefits. 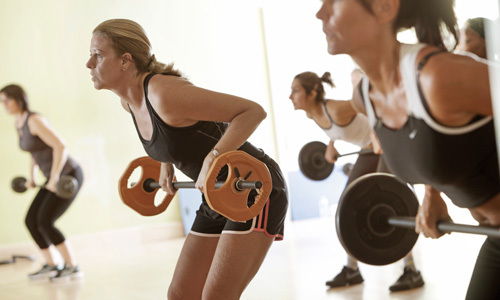 Taking a class is a great way to get in to the swing of going to the gym and to have a lot of fun doing it. There are a huge range of classes to suit all different tastes and with the expert instruction of the class leader you’ll be sure you’re exercising correctly and safely. As a complete health provider, Nuffield Health is dedicated to helping you get as fit and healthy as possible. So our gyms offer Health MOTs for free to all our members. These regular health checks help you keep track of your progress throughout your time at the gym, and can also help to flag any underlying health issues. If you have an injury it can be hard to motivate yourself in the gym, but it needn’t stop you keeping on top of your fitness. Many of our gyms have Physiotherapists on hand, or can refer you to one that does, to help you get back to your best by developing a programme you can use in the gym or at home. Most of us eat three meals a day and have the odd snack in between. With so much of our days structured around food it makes sense for us to pay attention to what we’re using to fuel our bodies. You may want to know more about the best foods to eat when preparing for a challenge event, or have had some digestion trouble? Many of our gyms have in-house Nutritional Therapists who are there to offer support. Our gyms are social spaces and each runs its own programme of local clubs, from triathlon training to Guiness World Record attempts and Burns Night suppers. Notice boards and staff can give you more details at your local gym. If you’re a busy parent it can be tough to fit in some ‘you time’. But many Nuffield Health gyms have a crèche with fully screened, qualified staff who will look after your children while you take a load off or fit in some energy-boosting exercise. Speak to staff at your local gym for more information.